IF YOU ARE IN NEED of an immediate service call, please contact our General Manager, Albert Jensen-Moulton, directly at 917-903-8281. OUR MAINTENANCE DIVISION provides our customers with services that include ongoing tuning and maintenance, pipe cleaning and repair, bellows releathering, console upgrades, wiring, and organ reconfiguration. Our multinational team of organbuilders has equal expertise in mechanical (“tracker”), electro-pneumatic, electric valve, and tubular-pneumatic actions. GLÜCK'S PNEUMATIC SPECIALISTS restore complex pneumatic assemblies and their specialized components when appropriate to the project, including electropneumatic relays and percussion actions. Missing or heavily damaged actions can be replicated when suitable models exists. INSURANCE APPRAISALS AND DISASTER ASSISTANCE SERVICES have earned us respect and trust through our meticulous replacement value calculation, damage assessment reports, and comprehensive recovery and restoration history. Architects and contractors call upon us for encapsulation, removal, storage, reconfiguration, or relocation of pipe organs during periods of construction, renovation, or restoration. INSTRUMENTS OF ALL SIZES, styles, and eras receive respectful care from our conscientious tuning and service personnel. Clients on our growing roster appreciate the financial benefits of individually tailored programs that keep every pipe organ operating at its best. "I've been a church organist for 45 years, and have worked with many organ technicians. 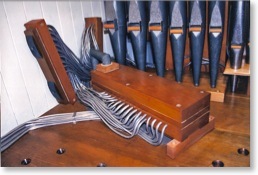 Before Glück Pipe Organs assumed responsibility of the instrument I currently play, the upkeep had been spotty. Glück performed good analysis to intelligently understand the instrument, its history, its strong capabilities, and weaknesses of its infrastructure. They have been particularly responsive to my requests, and have often developed creative "work-arounds" when costs have prohibited the most elegant solution. Glück Pipe Organs’ care of the organ has been impeccable!" Let us maintain your instrument with diligence, competence, and care. © 2019 Glück Orgelbau, Inc.